In this very special edition of Shining STARs, tonight at 7 PM we are featuring students from the Wilkes/Discovery Education Instructional Media program, who will be sharing some of the best projects that they’ve created during their coursework. Be prepared to be dazzled! You still have time to register. Vince Hill is the Director of Credenda, an eSchool in Prince Albert, Saskatchewan. Two additional presenters, Sue Hellerman, a math/science teacher from Vancouver and Ruth Abatzoglou, a science teacher from CA will share their work. The fourth and final presenter, Jennifer Brinson, our own PA DEN STAR and PA Leadership Council Events Team Member, will present her Google Earth project on the 10 richest v. 10 poorest countries on the planet, her digital story on therapy dogs, and frustration-free technology, some of the work she did for differentiation, lesson plans for World War II, Model UN, and Person of the Century. 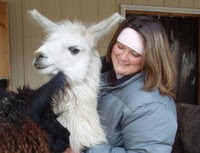 Brinson is the Instructional Coach at Salisbury High School in Allentown, PA (and loves llamas too).